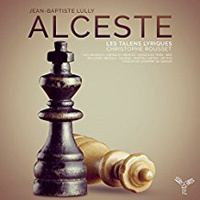 Description: Lully’s second opera and first masterpiece premiered at the beginning of 1674 with practically all of the stylistic characteristics of the rest of his tragedies lyriques already in place. 2 CDs. French-English libretto. Judith Van Wanroij (soprano), Edwin Crossley-Mercer (baritone), Emiliano Gonzalez Toro (tenor), Namur Chamber Choir, Les talens Lyriques; Christophe Rousset.